Warning: The following list should not be viewed superficially. To do so is to quench the Spirit and invite the displeasure of God. The character traits presented here require nothing less than a full time partnership with the Holy Spirit. They are evidence of a disciplined journey with Jesus and of the Christian advantage. Developing these qualities is your greatest challenge. Living them before the world is your greatest end times witness. The quality of love mentioned here goes far beyond the love we have for our spouse, children and friends. This love is born of a maturity so deeply rooted in the Spirit of God that it causes us to pursue the best for even our enemies. Close your eyes. Picture the one person who has hurt you most in life. Now imagine them in a lake of fire for all eternity. Your living witness to the power of the Holy Spirit (Love) may be the one thing necessary to keep them from going there. Time is short. Love like their tomorrow depends upon it. The quality of Joy mentioned here is far more than superficial happiness. 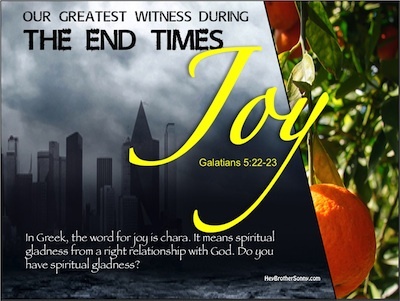 This joy draws so deeply from the power of the Holy Spirit that even physical suffering cannot steal it away. The world offers counterfeit joy, a fleeting form of superficial happiness. It offers no solutions, only a temporary masking of the pain. Your living witness to the power of the Holy Spirit (Joy) may be the one thing necessary to help your friends find eternal solutions. Time is short. Live like their tomorrow depends upon you! The quality of peace mentioned here is far more than an absence of conflict. 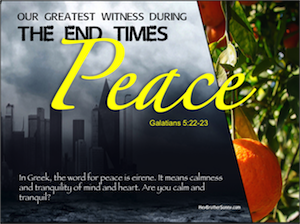 In fact, when the Holy Spirit is allowed to dominate the inner man, peace can even be found in the midst of conflict. A Christian's peace is not governed by external conditions. It is governed by an internal tranquility that is empowered by a selfless partnership with the Holy Spirit. With great intention, the Prince of Peace fashioned a whip and cleared the temple in John 2. In Luke 7, Jesus awarded great praise to a commander in the Roman army, yet He did so without even a hint of admonition that the Centurion should leave his military profession. In Matthew 23, Jesus launched a verbal barrage against the hypocrisy of His day and, in Luke 22, He instructed his followers to buy swords. Jesus is not a pacifist, yet He is the Prince of Peace. Do not let the world judge you as a person without backbone. Ours is a peace that passes all understanding. On the one hand, it compels us to turn the other cheek, pursue unity and engage in self-sacrifice to promote reconciliation. On the other hand, it empowers us to protect the weak, defend the innocent and boldly confront all those who would abuse God's temple, our body. Your living witness to the power of the Holy Spirit (Peace) may be the one thing necessary to help your friends see Christianity for what it really is. Time is short. Live like their tomorrow depends upon you! The quality of Patience mentioned here is far more than just a slowed pace or a sacrificed schedule in order to meet the the needs of others. 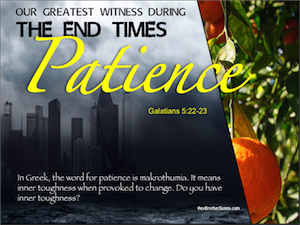 This patience draws from a determined will emboldened by a partnership with the Holy Spirit. The world’s hurried pace weakens our resolve and distracts us from the need to develop this inner muscle. In order to gain spiritual sinew, we must spend more time in God’s gym. We must workout regularly under the tutelage of Heaven’s ultimate Trainer, the Holy Spirit. Your living witness to the power of the Holy Spirit (Patience) may be the one thing most necessary to help your friends understand how to survive the coming onslaught of spiritual compromise. Time is short. Live like their tomorrow depends upon you! The quality of Kindness mentioned here is far more than just occasional acts of service. 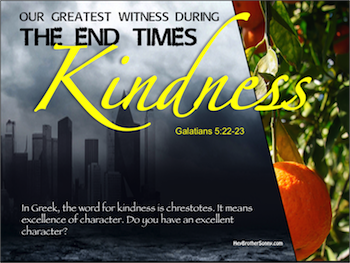 This kindness shows itself in all areas of a person’s character, speech, thoughts, goals, motives, etc. Only through a vibrant partnership with the Holy Spirit can this depth of personal character be achieved. Someone has noted that the true character of a man is not measured by what he does in public but by what he does when no one is looking. The kindness addressed here prompts an excellence of life regardless of who sees. It manifests itself not for the purpose of gain but just because it is right. The world is selfish and it is cruel. Your living witness to the power of the Holy Spirit (Kindness) may be the only thing providing your friends with true hope. Show them a Savior Who loves with pure motives. Time is short. Live like their tomorrow depends upon you! The quality of Goodness mentioned here is far more than just a reputation of kindness. Goodness is character excellence in action. Someone has noted that wisdom is knowledge applied. Similarly, Goodness is kindness applied. Only through an ongoing partnership with the Holy Spirit can the practicality of applied kindness be maintained. 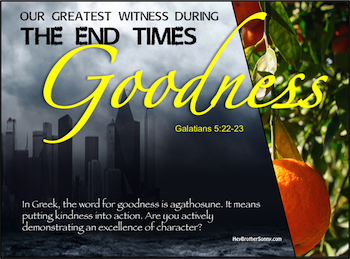 Goodness is intentional, it is premeditated and deliberate. The world is corrupt. It promotes a version of “the good life” that has been polluted by self-abuse and false positives. A living witness to the power of the Holy Spirit (Goodness) may be the only way your friends will ever encounter the pristine purity of the good life in Christ Jesus. Time is short. Live like their tomorrow depends upon you! The quality of faithfulness mentioned here is far more than just punctuality or casual loyalty. 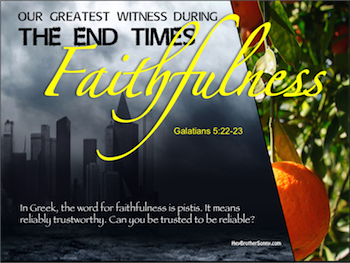 Faithfulness is being consistently dependable. It is a quality of character that is worthy of the trust and reliance of others. The world selfishly pursues its own goals. Worldly faithfulness tends to come only when two people are already going in the same direction. It is a by-product of common circumstances rather than a relational foundation born of a chosen commitment. Someone has noted that “tough love” is the choice to love even when it is unpleasant. Similarly, faithfulness is the choice to be reliable even when circumstances are not convenient. Only through an ongoing partnership with the Holy Spirit can this type of Divine dependability be developed and maintained. A living witness to the power of the Holy Spirit (Faithfulness) may be the only way your friends will ever find a Divine anchor in the storms of life. Time is short. Live like their tomorrow depends upon you! 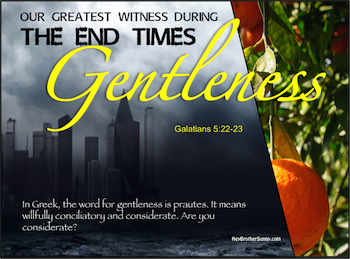 The quality of gentleness mentioned here should not be confused with weakness. Biblical gentleness is born of an inner toughness that facilitates the disciplined choice to be conciliatory and considerate. Only through a mature partnership with the Holy Spirit is this level of character discipline achievable. The world’s brutish nature causes many to default to a survival of the fittest approach to life. Gentleness is only exercised when their superiority has already been established. For the Christian, the choice to be conciliatory and considerate comes as a response to the cross, not an act of charity born of an ego rush. A living witness to the power of the Holy Spirit (Gentleness) may be the only way your friends will ever experience the tender nature of the Savior. Time is short. Live like their tomorrow depends upon you! This element of the Holy Spirit partnership is perhaps the most telling characteristic of all. Many of today’s most deceptive false teachers so emphasize the free side of grace that they discredit personal responsibility in the receiving and fostering of God’s grace. Notice again the first half of this hyphenated word - self-control. One of the greatest lies being preached today is that the free nature of grace removes personal responsibility to receive and grow in that grace. A living witness to the power of a Holy Spirit partnership (Self-Control) may be the only way your friends will ever understand the part they play in the journey toward a full relationship with God. Remember, time is short. Live like their tomorrow depends upon you! 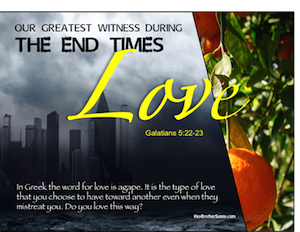 Back to Top of "Greatest End Times Witness"